AlbumMe is a practical and easy to use application that can help you create slideshows with ease. 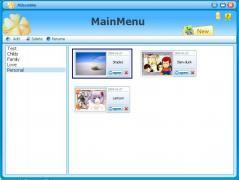 It enables you to add text captions, effects and background music, while also supporting animated templates. The application makes it possible to quickly create, delete and rename albums. Once you load all the photos and videos you wish to use in your project you can also load blank images on which you can apply a custom background color and add a hyperlink. Regarding image editing, AlbumMe lets you tweak brightness and contrast, rotate, flip, crop, zoom in and out, insert hyperlinks and apply effects. There are also numerous built-in templates and more can be downloaded from the app’s official website.